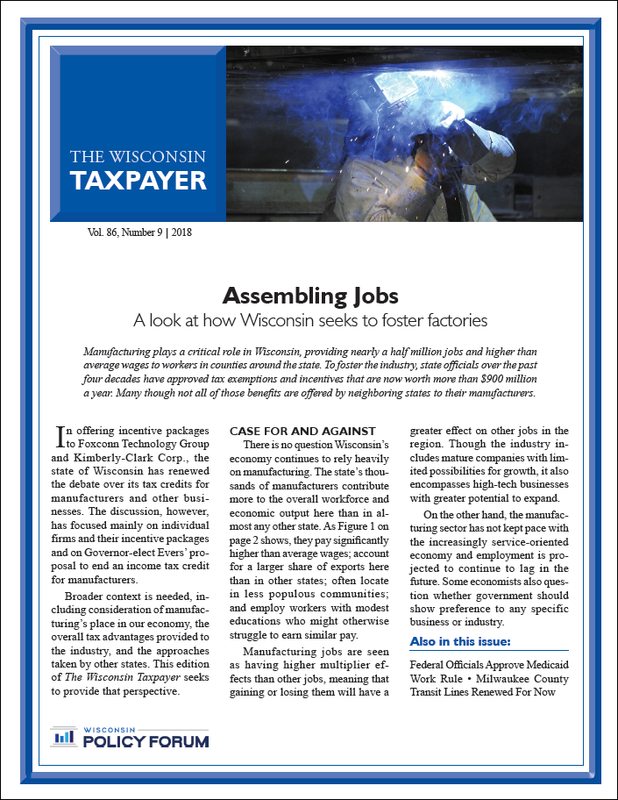 Manufacturing plays a critical role in Wisconsin, providing nearly a half million jobs and higher than average wages to workers in counties around the state. To foster the industry, state officials over the past four decades have approved tax exemptions and incentives that are now worth more than $900 million a year. Many though not all of those benefits are offered by neighboring states to their manufacturers. In offering incentive packages to Foxconn Technology Group and Kimberly-Clark Corp., the state of Wisconsin has renewed the debate over its tax credits for manufacturers and other businesses. The discussion, however, has focused mainly on individual firms and their incentive packages and on Governor-elect Evers’ proposal to end an income tax credit for manufacturers. Broader context is needed, including consideration of manufacturing’s place in our economy, the overall tax advantages provided to the industry, and the approaches taken by other states. This edition of The Wisconsin Taxpayer seeks to provide that perspective.